We have discussed this before, but now I am wondering what the latest info is. I know the last word was that France has the oldest L21 haplotypes. What I am wondering now is whether anyone has compared the L21 variance of the Continent as a whole versus the British Isles and Ireland as a whole. I consider Ireland a British Isle. These are confirmed L21* 67 length haplotypes only. "Var" is variance for the 50 non-multi-copy/non-null STR's out of the first 67 and is expressed as % of P312 "all" variance. M222 is not included. If you include M222, the British Isles variance decreases. This coincides with what we know about L21's older age on the Continent. I am inclined to think that L21 could have arisen further east of France or Germany, however. I know that I am jumping the gun saying that, but some of these Eastern European finds are interesting, especially ones that do not match any Brits (or anybody else) closely. I am in agreement that an origin east of France and Germany should not be ruled out at this point. I more or less just "wondering out loud" but felt like I had to re-iterate what I'm seeing. I've been going through as many major FTDNA projects as I can looking for new L21 folks as well as, now, L21 "predicted". In my "predicted" cateogories, I'm looking for 67 ht length R1b1b2 people who fit 1030-Scots (Scots 24, Scots 22 and Little Scots), Irish TII (South Irish), Irish TIII (L226/Dalcassian), Irish Sea/Leinster(L159.2), Irish TIV, Wales I and 11-13 Combo. Occasionally I find someone who "kind of fits" from France or Germany, but generally the core continent has "unclusterable" people. This is an indicator of diversity/age. However, what really astounds me is that whenever I run across someone who "fits" the clusters I mention above AND they have an outlier STR or two (like 2 from WAMH or whatever rather than 1) those people always seem to be from England. We call these groups "Irish this" or "Irish that" but it kind of seems like no one is really from Ireland. I guess in a truly ancient sense, that has to be true. Nevertheless, perhaps we should think of the Irish of L21+ types as just the "Goidels of Ancient Britain". Is there any thing in your research that shows an Anglo-Saxon period/Germanic L21 signature? Surely some must have trickled in from the continent later than the Bronze and Iron ages. I suppose some of them could be these unclustered and off-modal types in the Isles. Still just from looking at the Yahoo L21 data most Isles and colonial types have shorter genetic distances with the Scandinavians and Germanics (including Dutch members) on average. France and Spain are usually more distant to them. 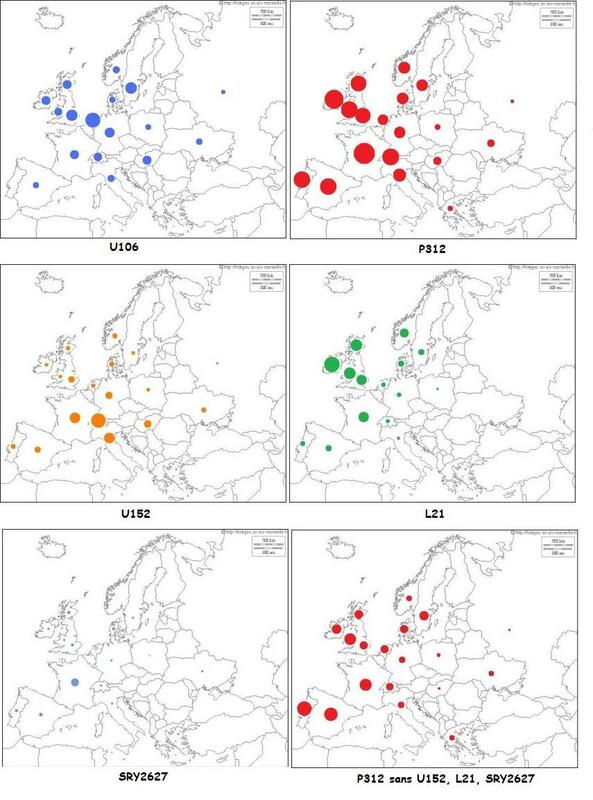 This would suggest that even for Bronze and/or Iron age movements L21 mostly came from the lower Rhine and north German plain rather than Armorica or Brittany. Of course, one of the problems we have is the silly Brabant project isn't testing Belgians for L21. If they were, we would know more about the level of L21, if any, in Belgium. We always seem to get the short end of the stick, just like in that Ramos study of French R1b, which failed to test either P312 or L21. Then Myres did a piss-poor job with its sampling, almost like they were hunting for pockets of U152 and U106. I was thinking in terms of genetic distance, otherwise I agree. The French L21, though more numerous, don't really show a more recent connection to the Isles members like some of the Scandinavians, Germans, and Dutch on average. Admittedly I've only looked at a relative handful of the total, but if the French members are closer I haven't seen it. overall though it seems that L21 is most significant from the Seine to perhaps the Garrone, (basically the western half of north and central France) and has a modest but significant presence ias we progress through central France towards the Rhineland and the Alps. I get the impression that the link between Atlantic France and the Rhineland/Alps area took a route that meant L21 didnt really move much along the Rhine north of the middle Rhine. I have always fancied that L21 occurred as some S116* entered France from the middle Rhine/Main area via the Mosselle, thus explaining the lack of L21 in the Lower Rhine. I believe Mike indicated that north-central France has the highest L21 variance and that would very nicely fit that model. I think we have to keep the Lower Rhine as a consideration for significant L21. As Rich points out, some of the best testing of the Low Countries did not include L21, but I think there is another consideration as well. That consideration is that L21 in the Low Countries may be an earlier Bronze Age inhabitant but was "washed out" by later immigrants (probably U106 and I1) from the Jutland Peninsula. I don't totally understand the history but wasn't there a lot of flooding that caused people east and north of the Low Countries to come in as well as over to England (Angles, Saxons, Jutes, etc.)? I don't think anyone else tracks with me on this but I still like Han de Beule's analysis of I-L238 and R-L21. His detailed analysis of the coastal versus inland areas where the Rhine dumps into the ocean involves the hypothesis that I-L238 and R-L21 were there but became scattered "remnants" by the time of or because of the new Jutland people coming in. And, of course, Hubert (whom I respect greatly but who seems to have gone out of fashion) believed the Goidels/Beaker Folk who went to the British Isles did so from Westphalia (Nordrhein-Westfalen in Germany) mainly. I have maintained for some time that some portion, through probably a comparitively small one, of L21 in England arrived with the Anglo-Saxons. While it is often assumed that there isn't any L21 in northern Germany, a quick glance at the L21 project map shows this just isn't the case. We also know that L21 is present in low but not insignicant numbers in Denmark. If we can believe the Myres' data, L21 comprises a little over 6% of the male population in that country. This increases in northern Denmark to just under 10%. Presumably this represents north Jutland, a area believed to be the homeland of the Jutes, one of the invading Germanic tribes in England. Thus it is not entirely fanciful to suggest that perhaps some 5 to 10% of the Anglo-Saxons who came to England may have been L21. Personally I wouldn't be a bit surprised by the eventual discovery of one or more subclades under L21 that turn out to be primarily Germanic- at least by 5th century AD standards, whatever their ultimate origin may have been. I can predict right now what the problem is going to be with any continental subclade of L21. As soon as even one person with British Isles ancestry is found to belong to that subclade, all bets are off: it's going to be labeled as British or Irish and its appearance on the Continent chalked up to Scottish merchants, Irish monks, Wild Geese, etc. We need a super-continental L21 subclade, one without any Isles members, for it to be believable. The problem is, how likely are we to find a clade like that? And if it had no Isles members, it wouldn't be of any use in establishing an Anglo-Saxon or Viking connection. We were pigeonholed very early by a couple of knuckleheads, I'm afraid, and no matter how many continental L21s are found, it won't matter. We'll always be the British Isles haplogroup. Even the maps in the recent and infamous Myres report perpetuate the illusion. The L21 map has a shading scale where the dark blue is up in the 70% + range. Frequencies of 20 or 30% hardly show up, they are so light. The effect is that the L21 map in Myres makes it look as though all the L21 is in the British Isles and there is very little on the Continent. The other haplogroup maps, on the other hand, like the U152 map, for example, have the dark blue set at around 30%. That way, even frequencies of 10% or so stand out on the map. Yes, that is craziness. I noticed it too. It crazy to put frequency charts side by side to be easily "compared" but have a different scale for the shading per each chart. We need to start making variance charts rather than frequency charts any.way. The variance will tell the story. Balaresque has nice chart of this that does look a lot like Neolithic gradients. There is no doubt that those who have preconceptions will find a way to interpret the evidence in a way that conforms with their beliefs. But let's say we eventually discover an L21 subclade which is primarily located on the northern continent, and the Isles members are primarily in those areas of England and Scotland where there was Germanic settlement. I think it would be very difficult to sell the usual explanations, though I have no doubt some would attempt to do so. As for the Myres' maps, I am simply unable to figure out how they were constructed. For instance the U106 map is heavily shaded in Norway. But look at their data for Norway. There isn't any! Someone on another forum once tried to explain how the statistics could be projected from other countries. Yet everything I have seen so far suggests that R1b in Norway is predominantly P312. To be honest I havent heard anyone claim that L21 on the continent is down to migration from the isles for a long time now. The only thing I would concede is that L21 is more north-westerly than U152. So that their centres of strength differ. They are both close siblings of very similar age (and therefore almost certainly originally of the same language and culture) and that age is far older than the various cultural labels given to it like La Tene, Hallstatt, even Urnfield. These clades are much older than those cultures and I think its rather silly to keep trying to ignore this and labeling S116 clades with these cultural labels. I made several maps using data from FTDNA and Ysearch (L21-U152-U106). Each circle on the map is proportional. We clearly see the difference in distribution between the two brothers L21 and U152. Today, it is in the British Isles we find most of L21! To deny this would be bad faith! Very interesting- thanks. I would very much like to see your U106 map as well. A suggestion: I think it would be easier to compare the maps if they appeared side by side, rather than jumping back and forth. I don't have any idea how difficult it would be to change that format. That map seems a pretty good representation of reality as far as we know it. There had never been any doubt that L21 found it greatest space to expand in the British Isles and much of it is there. However, it is likely that L21 first occurred somewhere close to where S116 first happened and that its expansion in earnest began in France. There was a very high L21 hit rate for French R1b1b2 tested by the project so its clear there is a decent amount of L21 in France. When testing was taking place, Bretons were excluded so that the claims that the French L21 is due to British settlers could be avoided. L21 still came up very frequently in the testing of French R1b1b2 for L21 despite the exclusion of Bretons from the testing. So, this seemed to establish beyond any reasonable doubt that L21 is native to France, even if its numbers are well below that of the isles. I do the ratio between the countries. Then I count the total of P312, L21, U106 ect .. on Ysearch I multiply by the ratio calculated on FTDNA ..
Merci beaucoup, Jerome. Congratulations on producing a very interesting and instructive series of maps. They appear to be far more reliable than the maps in the Myres' paper. Perhaps they should employ you for their next study! There are some very interesting points. I think the comparison of the overall U106 vs. P312 distribution very illuminating. I also think it is very instructive to compare Scandinavian distribution in each of the maps. There is only one result which looks unlikely to me. The P312* (XU152,L21,SRY2627) shows a stronger presence in Wales than in England, and everything I have seen indicates P312* is rare in Wales. Very cool, Jerome. Thank you. I love the flip action .gif file between U152 and L21. I guess simple minds (like me) are easily amused. Did you notice how the dots all change except France and Iberia? Seems like a very even balance between L21 and U152 there.